This article tries to inform you what it's like to play this game. This is game is by no means arcade! It's not even close to it. The game has a steep learning curve. You will find out after a while that you gain a lot of knowledge about vehicle helicopters, weapons systems, combat realism, etc. The game has a bad multiplayer performance. Although, it is possible to play together via the Internet, it's not superb. 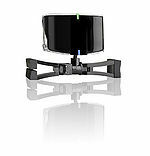 A TrackIR is a device that can track a player's head movements. The player is able to change the pilot's view direction by moving his head. The device is attached to your computer screen. It will read your head movements and implement it in the game. This is best explained by a movie. You can try out the game just with your keyboard. But if you want to have some nap of the earth (NOE) flight experience you should try a joystick. If you find yourself tapping the autopilot key everytime you're facing a difficult manoeuvre (like facing waypoint A after take off) you're in need of a joystick. Have a joystick with many buttons. When having both hands on the joystick and you get fired upon you can't make it to the keyboard. You'll have to have all priority buttons in close proximity of your hands. 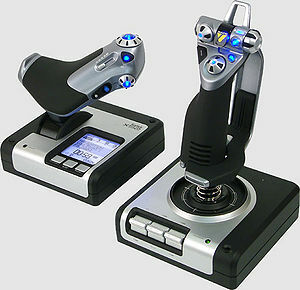 A HOTAS (Hands On Throttle And Stick) is superior over the 1 stick joystick. With even more buttons, the degree of game control is pretty well. This page was last modified on 8 April 2008, at 22:18.